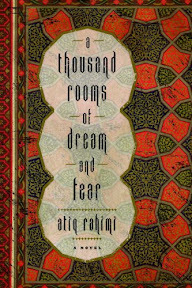 A Thousand Rooms of Dream and Fear [Book Review] – my books. my life. Farhad, a student in Kabul in 1979 (just before the Soviet invasion), awakes to find himself in a strange home. As his consciousness and memories slowly come back, we learn he broke curfew and was beaten by soldiers as a result. A young widow and her son have taken him into their home to nurse back to health. If the soldiers find out, they will all face danger. Farhad can’t stay but he also can’t leave. I read this book as part of Jen and Nicole’s Book Club. The setting is what originally caught my interest but it had me at “sparse language.” I am in awe of authors who can say a lot in a few words and Rahimi is definitely one of them. I read A Thousand Rooms of Dream and Fear in essentially one sitting. The language flows and breathes. It is almost like reading a novel in verse. I think some of this credit must go to the translation as well. Despite the brevity of A Thousand Rooms of Dream and Fear, it packs a lot of punch. It conveys the fear and panic the characters feel under the current regime as well as the tender affection Farhad feels for his family and his rescuers. I found myself thinking about it for some time after I put it down. The one fault I found with it (and I guess this could be a big one) is the ending. I’m still a little confused about what actually happened. I’m hoping the discussion helps me figure it out. If the topic interests you, I can definitely recommend A Thousand Rooms of Dream and Fear. I cannot wait to start reading this! I am glad to hear you liked it. I am a little hesitant to read it if the ending confused you..
I’ve seen this one around and it does sound good, but I just have so much to read. Ahh. The ambiguous ending strikes again. I agree that both author and translator did great work. Thanks for joining us. I am looking forward to the discussion. Interesting short and sweet review, Michelle! The words that stayed with me are ‘sparse language’ and ‘it is almost like reading a novel in verse’ 🙂 Hope you have a wonderful discussion on this book.